Black rubber bumper / stopper used on coil mechanisms and as ball rebound on some playfields. Direct replacement for Data East, Sega, and new Stern Pinball games # 545-5105-00. Can also be used on other makes/models. 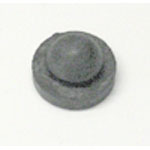 Measurements: This rubber grommet fits through a 1/4-inch diameter hole in 1/8-inch thick metal. Front (large) portion is 9/16-inch diameter and 1/8-inch thick. Rear (small) portion is 5/16-inch diameter and 1/8-inch thick.